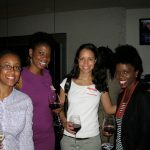 This post is not just a recap, but a huge THANK YOU to all the lovely ladies who came out to our HBW Happy Hour in Charlotte, NC! We had about 20 women join us throughout the evening – various ages, many different backgrounds, yet all connected through our shared desire to live life on our own terms. On Friday night, I hosted a HBW Happy Hour in Charlotte for the first time. It was the 2nd stop on my Fall 2012 Happy Hour Tour and we had so much fun eating, drinking, talking and laughing in the Lobby Bar at the Westin Charlotte. Who showed up? Our lively group was made up of bloggers, naturalistas, lawyers, travelers, coaches, hairstylists, consultants and business owners – all on similar, yet different journeys to live their ideal lives. I loved meeting Shanice, who told us about her experience in recently launching her web design business – check out her creative work and portfolio at: http://shancamcreative.com. Leaving the #hbwhh. I had such a great time! It was a such gift to meet Wilma Jones @livinghappieraf (pictured with me below) and hear her story of not only surviving, but thriving after divorce. I’m so grateful she made the 6 hour drive from DC to be with us! You can find out more about Wilma’s powerful book and upcoming tour at: http://livinghappierafter.com. She is rediscovering herself and choosing to dance in every area of her life. Definitely an inspiration! If you were there, thank you again for bringing your light to our gathering. It was an honor to meet you. Group shot of several Charlotte HBW who came out to join us! New Mary Kay consultant Regina (far left) was so sweet to bring roses for the ladies.